Parking tickets and zoning violations aside, Hoboken’s main source of revenue is tourism which includes the infamous first Saturday in March. I know you don’t want to hear it. No one in Hoboken wants to admit it. Hell, I even hate to say it (or write it). 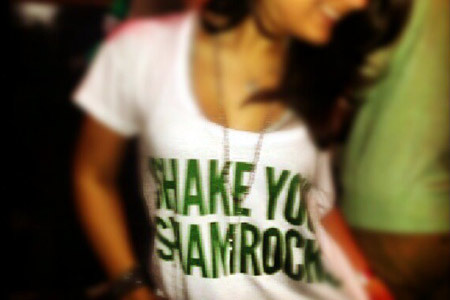 But the fact of the matter is, we need days like Hoboken St. Paddy’s Day (the first Saturday in March). It’s true. And this is coming from the guy who has sworn off these types of drinking holidays because of the amateurish insanity they tend to attract. Like it or not; Hoboken wants to be a tourist town. Two of the biggest attractions in any tourist town are the bars and restaurants. Not unlike other such cities (NYC, New Orleans, etc. ), Hoboken needs people to eat, drink and be merry in order to survive. What is always forgotten in these debates is the number of other businesses that depend on these types of weekends. Pizza, fast food, cafes (such as mine), etc. all need the influx of people such events tend to bring. That being said, I’m not condoning the depravity, stupidity or violent outbursts that have plagued this day in recent years. I’m all for the $2,000 fines for such behavior. I’m simply saying that, with little if any other form of industry left here, there needs to be certain a level of tolerance for days such as this. I do hope that the city can somehow figure out how to better take control of the day, though. They’ve tried before. Starting about 10 years ago, city officials thought by bearing down on the bars, they’d somehow curb the disorderly conduct in the streets. Sadly they were wrong. The added restrictions such as redefining queuing up outside of a bar as loitering and not allowing organized bar crawls only drove more people into private house parties. And that’s when the troubles began to escalate. Bars are public places. The police do not need an excuse to walk into a public place. So they are able to better monitor activities. However, in order for the police to enter a private home, they need to be called. By the time a problem has gotten to the point of needing to make that call, it’s already too late. Bars also employ their own security to help nip any incidents in the bud before they get outta hand. In 2012, things got so bad that the parade which was once the focal point of this day was canceled. Although the parade itself was never an actual part of all the alcoholic nonsense, it got irrevocably (and unfairly) tied to it. This was because people invited friends to their epic house parties on what was then called Parade Day. The only good thing that came from getting canceled is that the following year was there were fewer parties. More can — and should — be done. Easing restrictions on the bars would be a good step towards regaining some control of the day. Continuing with the Zero Tolerance policy and those $2000 fines will also help. I’d actually like to see those enforced year round. Of course that’s no comfort for people whose property gets defaced. Trust me, I know how it feels. My own cafe has been a target for drunken idiocy from time to time. What else can be done? How do we stop things like the showers of pee or puke on our walls and stoops? Well, leave it to those fun-lovin’ Germans to come up with a solution. Some brilliant minds in the St. Pauli neighborhood of Hamburg decided to combat the excessive public urination in an inventive way. Could this work here? I don’t know but it would be fun to find out. For those of you who say that Hoboken needs to finally grow out of it’s inebriated adolescence; Show me how. You enjoy the comfort and safety of the new Hoboken. Did you ever wonder how this became the new Hoboken? As I said before, there’s really no other industry here that can support the new lifestyle. The things that attracted the money that eventually raised Hoboken property values (attracting more money) are the very things people are trying to rid the city of. You really need to stop doing that. Unless you can think of some other way to keep the money flowing into our li’l city, that is. In the meantime, let’s work on coming up with solutions, not just complaints. And maybe we can bring the Parade back the way it was intended in it’s inception. As a day of celebration for everyone. For more on this subject — as well as a list of rules for revelers to follow — check out hMag’s Hoboken St. Patrick’s Day Comprehensive Guide.